Samuel Wesley’s two most well-known hymn tunes today are RIDGE and DONCASTER, but during his lifetime he was a prolific writer of tunes. Many were composed for hymn texts written by his father, Charles Wesley, and for collections of hymns compiled by his uncle, John Wesley. An example is the collection he published entitled Original Hymn Tunes, Adapted to Every Metre in the Collection by the Rev. John Wesley. Samuel made an important contribution to hymnody when he discovered in the Fitzwilliam Library, Cambridge, three hymn tunes written by G.F. Händel for words by Charles Wesley. One of these was a tune for ‘Rejoice! the Lord is King’. Samuel Wesley was born in Bristol, on 24th February 1766, the son of Charles and Sarah Wesley, and the brother of Charles Wesley Jr. It was in Bristol that his prodigious musical talent was first recognised. 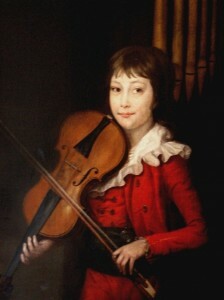 His musical education began in this city, and later continued in London when his family moved there in 1771. It was in London that he pursued a career in music as a teacher, organist and composer. He died in London, 1837.